(CNN) - "Uninformed, arrogant, naive." 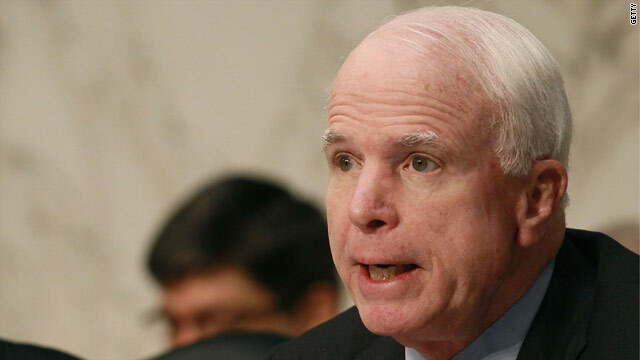 Sen. John McCain used those three words in an interview Sunday to slam the Citizens United decision, the 2010 Supreme Court ruling that paved the way for political donations from corporations and special interest groups. "That's why we miss people like William Rehnquist and Sandra Day O'Connor who had some experience with - with congressional and other races, with the political arena." He didn't even mention the Chinese hook on Adelson's money. Look it up. Chinese Mafia and Vegas money. I wish I had as much money as Buffet, then I would donate 1 billion to Obama's superPAC, then match Wrong-Way-Romney dollar for dollar above that. I would saturate radio and TV/internet with pro-Obama ads and dig up virtually every dirty detail on Romney and expose him and all the repug-lican criminals for the slimey liars they are. Everyone knows the only way they can win is by buying the election like Walker in WI and Scott here in FL. Too late to cry about it now Senator. Your party CHEERED that ruling, and every member of the Supreme Court that owes ultimate allegiance to your party for nominating them did exactly what your party wanted them to do, elevate the dollar above the ballot. Mission Accomplished. Mc Cain stated (for ones in a long time) the obvious and your comments here cover a lot. Thank you all!